I needed to make a quick and healthy dinner tonight and decided to simply search through my pantry and see what I could find. First, I opened the freezer and found some meatballs that I’d totally forgotten. 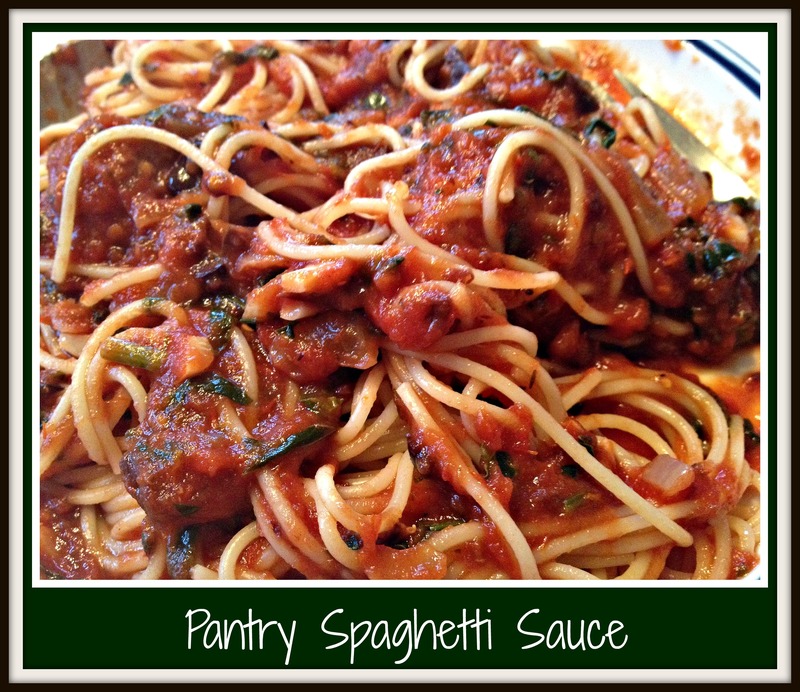 What goes best with meatballs in our house is spaghetti… but I didn’t have enough sauce to cover everything. I put the meatballs into a 375 degree oven and let them roast until they were browned and toasty. Mmmm…. now for the rest of the story…er… dinner? To make the sauce, I started with some leftover onion (I had about 1/4 of a Vidalia onion left in the fridge),olive oil, and a touch of butter. I sauteed the onion and then added 2 chopped garlic cloves and about 2 cups of thinly chopped spinach. Once the sauteed vegetables were soft, I added in a large can of crushed tomatoes and some red wine (like James River Cellars Rad Red wine), then let the sauce simmer for a bit. Salt and pepper, along with some Italian seasonings, had the sauce tasting really wonderful, but it was still missing something. That something turned out to be a packet of pitted black olives. Once chopped, they added a fabulously salty bit of yumminess that took the entire dinner to a new height. I popped the baked meatballs into the sauce and cooked the pasta (I used about 1/3 of a package of vermicelli) so everything would come together quickly when we were ready for dinner. Hint: Stir in a few ice cubes in with the pasta in the pot when it’s cooked to your liking, to stop the cooking process. I’ve found that it also keeps the pasta from sticking together. Weird, huh? I hope you’ll consider trying something like this for your next “quick” dinner… it’s amazing when things come together to make something so tasty AND healthy. Enjoy! This entry was posted in Cooking, Health, Wine and tagged easy recipe, healthy food, James River Cellars Rad Red, olives, pasta, red wine, spaghetti sauce, spinach. I’ve never heard of putting ice cubes in pasta to stop the cooking process or help the pasta from sticking together. I usually use olive oil to make sure the noodles don’t stick together. May try the ice cube trick next time. Great easy recipe too! Someone told me about it years ago… Probably when I was complaining that I didn’t have any olive oil to add to my pasta to keep it from sticking? Works really well… I hope you find it helpful! Thanks so much for reading and leaving a comment!